It took me a long time commit to putting art on my walls. I used to have a hard time finding art that felt enough like “me” to warrant hanging it up as an expression of myself for all my guests (and instagram followers) to see. Obviously, I was giving the idea of art a little too much power over my decorating style. Finally, I slowly started trying things out – the only real way to know if something feels “you” enough – and while I’ll never be an art expert, I find it much easier to find pieces for my home these days. I wanted to take you on a little art tour of my home today and give you some tips for decorating your walls. So far I’ve bought 99% of the art in our home as digital files from Etsy and had them printed. There’s so much to choose from there and I love being able to support another business owner. If you have a little bit of art anxiety like I did, I find it easier to pick something a little light hearted and quirky to start off. Pay attention to the art in the pinterest images you’re drawn to and try to find something similar. You don’t need the exact same art, but you can get a feel for the vibes you like. I decided that for the most part I like more realistic looking art over clip arty type stuff. 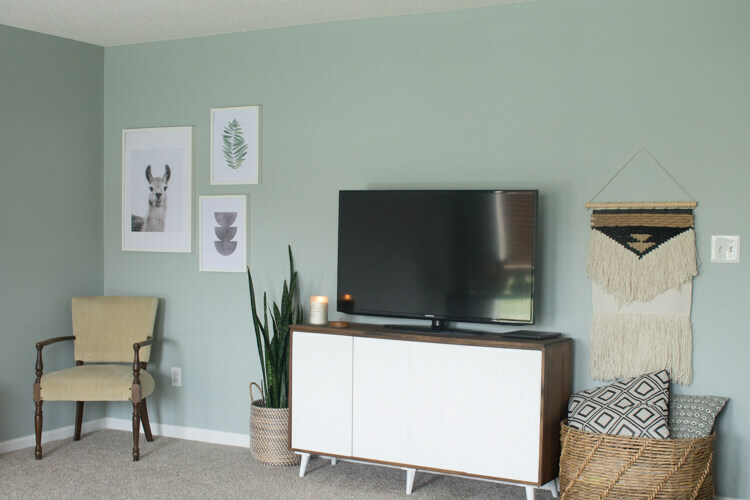 One of the first places I experimented with in our home was our downstairs living room. It’s where we watch TV and where the toys live. 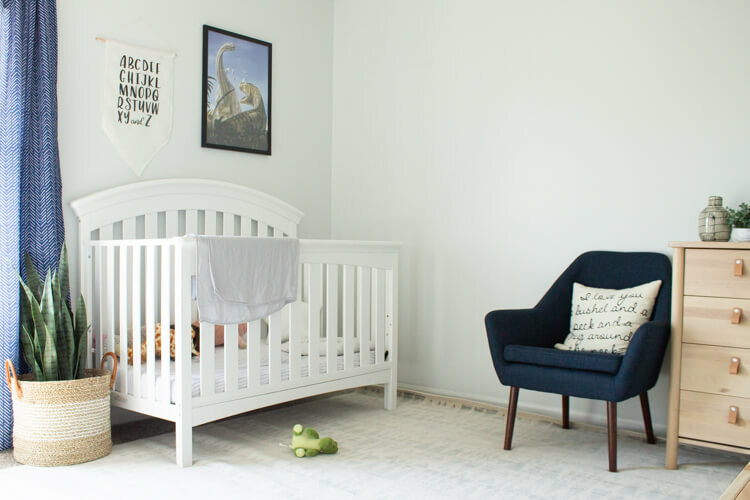 We spend a lot of time in this room and it’s one where we do a lot of living, so it was the perfect place to try out some fun prints. LLAMA PRINT // This llama print is one of the first ones I picked out. Definitely jumped on that trend and I still like having him in our living room. LEAF WALL ART // This simple watercolor print is perfect for the plant lover in me. That’s one message I’m not afraid to convey. I think this one could fit a lot of different styles depending on the frame. 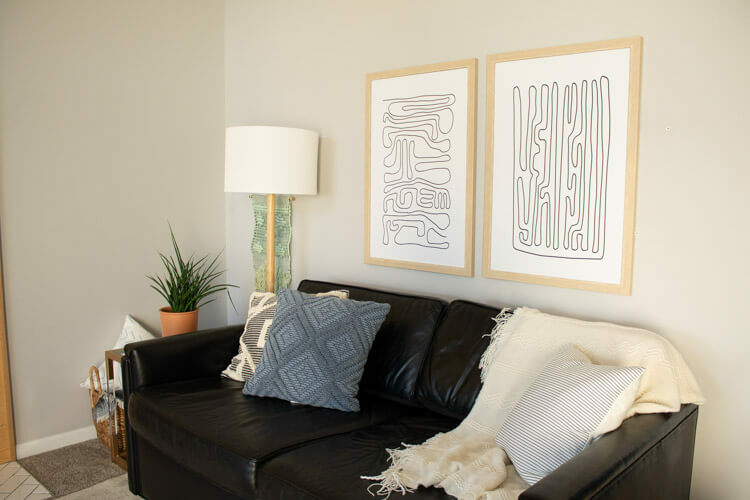 SCANDINAVIAN PRINTABLE ART // You can’t go wrong with black and white abstract art! When I put together multiple pieces of art I tend to choose mostly black and white prints with one or two pops of color. I do this so I have more freedom with the rest of the decor in the room. 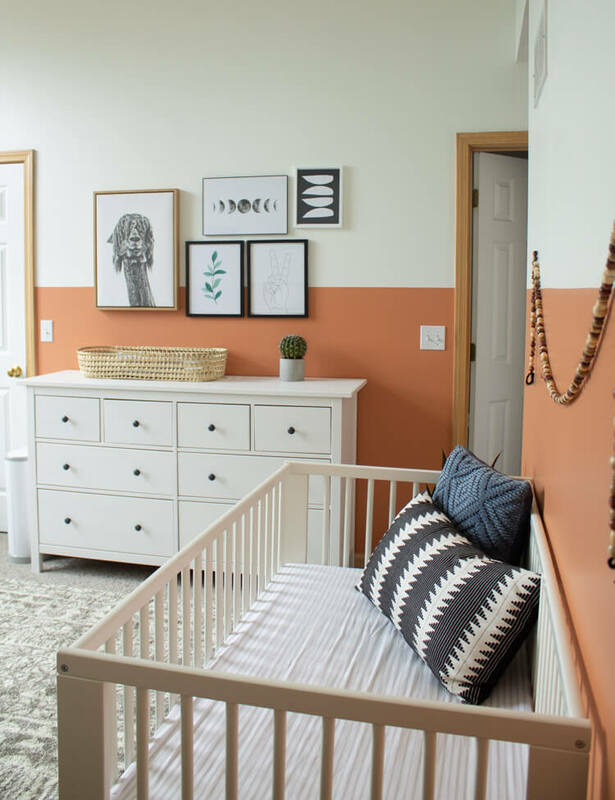 For this gallery wall in our color block nursery, I knew I wanted to mix and match different styles. I kept the color in this set super neutral because of the terra cotta walls. ALPACA CANVAS // This is one of the only ones that isn’t from Etsy. I really love this guy and his wild hair. 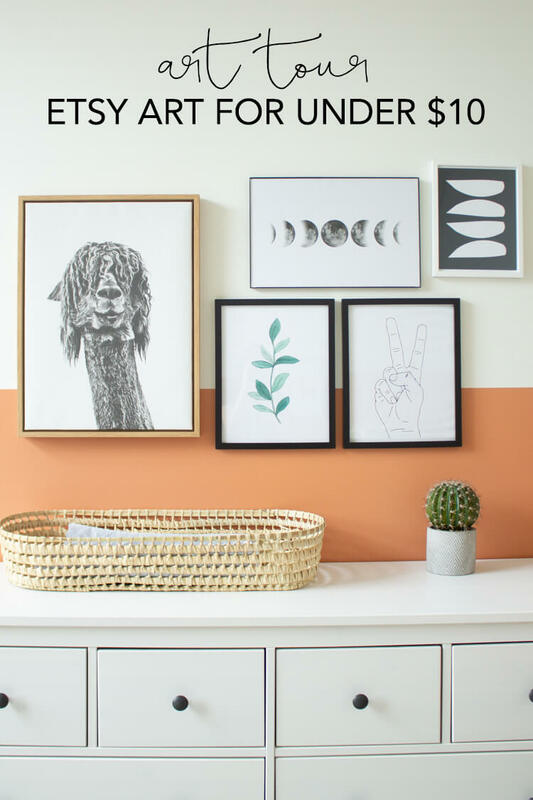 MOON PHASES WALL ART // I feel like this one is super modern and perfect for a kids room, although I can see it being used in any room. BOTANICAL WALL ART // Apparently I really like watercolor plants. I specifically wanted a picture of a plant in this room because I knew a real plant wouldn’t stand a chance since it’s a baby room. PEACE SIGN PRINTABLE // Guys, this is one of my absolute favorites. So much good vibes. NAVY ABSTRACT MODERN ART // I’ve really been drawn to these mid century abstract pieces. I have tons like this favorited in my etsy account. Another piece of advice I have for printing art is making sure it’s a decent size. 8×10’s are likely not going to cut it, go bigger. Way bigger! 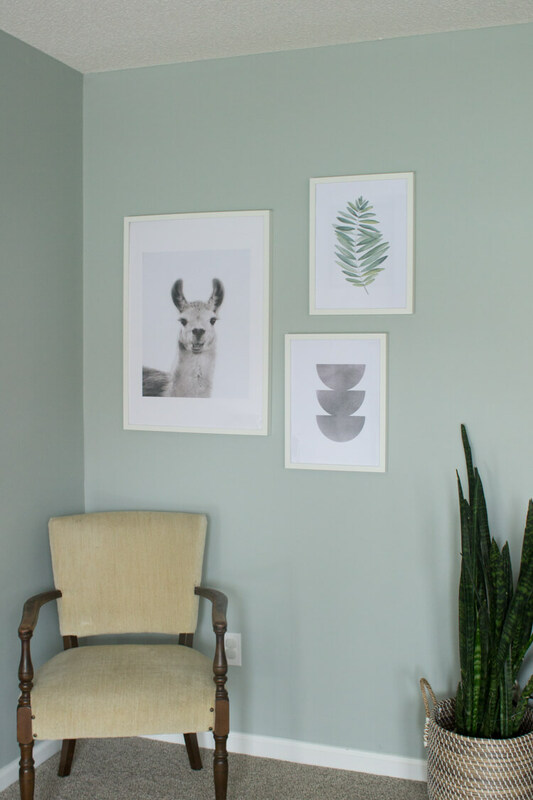 The smallest piece of art in that gallery wall is an 8×10. 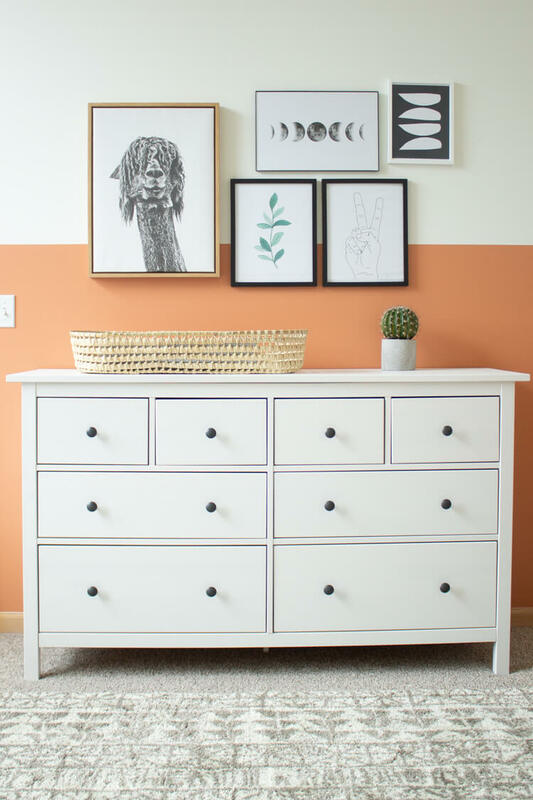 I know that bigger frames can be expensive, but a bunch of small frames is usually going to look cluttery and probably isn’t the look you’re going for. I like to buy poster frames for a cheaper alternative. IKEA also has a good selection of larger frames at decent prices. These two pieces of art in our living room are 20×30″. They’re huge and perfect for the space. The design is from Etsy and I used an online framing service Frame It Easy to have them printed and shipped to us. Easiest process ever. They got the name just right, ha! The art in Graham’s room was a little different. I actually got those prints out of a dinosaur book from the library. I just scanned them to my computer and then blew them up as engineer prints. They turned out way awesome and I have a few more I still need to get hung up. You definitely need to be a little careful with this method, as you don’t own rights to the art. It’s fine to use in your own home but be sure you not to sell or distribute anything you find that way. I’m so glad I finally just picked out some art and starting hanging it around my house. It might not all be perfect, but I’ve definitely found some great pieces and our home feels more homey for it!